A nice quick post this afternoon–just wanted to share the further success of one of my favourite Indie writers, J. M. Ney-Grimm. Savvy readers will know Ney-Grimm from the several reviews I’ve done of her work. If you haven’t read any of her stories yet, go check them out–they’re set in a Nordic fantasy world, often based on fairy tales (or such tropes), and have a very characteristic “effervescent” style. Well written, fun stories. 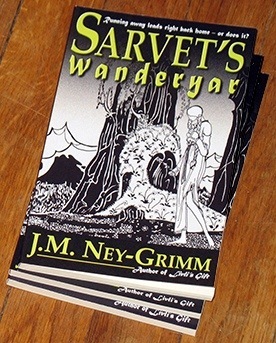 One of those stories, Sarvet’s Wanderyar, has been on my plate for a while. I’ll be reviewing it coming up soon on the blog, but wanted to share her good news now: she’s published it in paperback! You can get the book on Amazon, Barnes and Noble, and CreateSpace. You can read about her release here. And while you’re at it, why don’t you check out her work on Amazon and Kobo? Trust me, they’re great books. We’re going to do something fun today. As I’ve maintained this blog over the past several months, I’ve thought about what it means to be Indie. Indie publishing; Indie music; Indie film…they all have to do with not moving beyond consumption of a product toward developing it yourself. Putting your own stamp on it, as it were, outside the regulations, cultural mores, or “supposed-to-haves” of the traditional model. And as I thought about this, it occurred to me that I’m doing something similar with my newest hobby–making beer. I’ve wanted to try home brewing for quite a while, and after pulling out my first batch this past weekend, I can say it was a really fun experience. I enjoy a good beer, but there’s nothing quite like sipping your own brew. A satisfaction not altogether unlike seeing your book in the Amazon store. In fact, home brewing isn’t that different from writing and publishing your own work, once you get past the malt and yeast. The great thing I’m learning about beer is that once you get past the Budweisers and Coors and Alexander Kieth’s (previously my favourite), there’s an enormous variety out there. Samuel Smith’s Nut Brown tastes like hazlenut and chocolate; Weihenstephaner makes a dunkel that’s like buttered and toasted rye; the Vermont Pub and Brewery makes their own sour beer that’s like a mix between cider and brandy. But when you get down to it, this incredible variety comes down to four ingredients: malt, yeast, hops and water. Likewise, there’s as many different types of fiction as there are writers. Our trade defines variety by way of our creativity. And yet, any good story has essential ingredients like plot, character, conflict, a call to action, and so on. As with great beer, the variety comes with how those ingredients play off each other, and how well you use them. In beer making, sanitising is paramount. It’s so easy for your beer to become infected from the tools you use, not washing your hands, even yeast that’s gone off. The result is a lot of bad flavours in the beer–or worse, a bacterial infection. But there’s an exception to every rule: sour beer is, quite literally, beer that’s become infected and been allowed to develop “off flavours.” It’s an aquired taste, but much sought after in the craft brew world. The thing is, you can’t just infect your beer and hope it will turn out–you have to know what you’re doing, and where it’s appropriate to introduce an infection that might otherwise kill your brew. The best writers know when to follow the rules, and when to break them. They can tell instead of showing and get away with it. They can add pages of flat exposition with such flair that the reader doesn’t care. Star Wars has some of the most tired and overused tropes in storytelling–but it works, because Lucas knew how to make those cliches work for him. Anyone can break all the rules and try to be revolutionary–only an artist can pull it off. The first thing that surprised me when learning how to make beer was how easy it looked. The second thing was how difficult is really was. Beer making really comes down to balancing your ingredients properly, adding things at the right times, and making sure everything is clean. You can pick up a brew kit as a complete novice and brew a decent batch in six weeks with no experience or hand holding. But if you want to be good at it, you have to hone your craft. I’ve talked to people who’ve gone deep enough to grow their own malt, hops, and yeast. It’s one of those things where you’re going to get out of it what you put into it. Writing’s much the same. Anyone can put a plot on the page, but that’s not really writing. It seems easy, and on the surface, it is–many writers plonk down their first draft without breaking a sweat. But it’s the crafting of that story that’s hard, and I’d venture to say that few people become absolute masters. The really good writers are the ones who make it look easy, knowing full well just how difficult it really is. But on the other hand, it’s not an unapproachable craft–just pick up a pen, put it to the page, and see where it takes you. Like beer making, you can go as deep as you want. Remember what I said about sterilization? I’d say at least 70% of the time it took to brew my first batch was taken up with cleaning. It took me fully an hour and a half to properly clean all the bottles before I was able to prime my beer–filling them took about twenty minutes. Fortunately, there are tools to help cut down that time, but it’s still crucially important. And it’s not just proper cleaning–if you add your hops at the wrong time, you’ll introduce an oily bitter taste; too much malt can make it overly sweet; not allowing it to ferment long enough can produce exploding bottles that sends glass through drywall. There’s an adage in the craft brew world that it’s really hard to completely ruin a batch, but by the same token, if you don’t watch what you’re doing, it’s not going to turn out as you like. This last one is probably the most important, and it’s easy to fall victim to it on both fronts. A hastily published book–without proper editing, cover art, formatting and so on–is pretty obvious. It turns readers off, and can damage your platform. And a lot of writing is about getting those fine details right–not just spelling and white space, but asking if your character arcs make sense, or if your continuity’s off. These are things that can’t be accomplished on your first draft–you need to be patient as you work them out. Likewise, patience is the absolute key when brewing beer. One of the biggest reasons a batch can fail is because it was rushed–and in fact, many first time brewers dump a batch that would have been perfectly fine, given time to condition properly. I’m experiencing this right now, actually. My first batch was scheduled to finish last Friday, so I put a couple bottles in the fridge. After more than six weeks of anxiously waiting to tip back the first bottle, I was chomping at the bit–but the first glass (pictured above) tasted watery and thin. The flavour was there, but something was missing. I did some research, and found that this is pretty common–it just means it hasn’t had enough time to carbonate. Notice that it’s got a thick head but almost no bubbles in the beer? 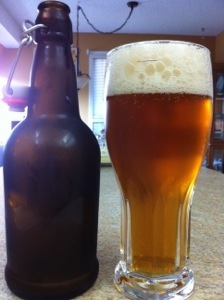 The carbonation is coming out of the beer too fast; it hasn’t had time to properly dissolve in the liquid. So I’m leaving it for now, and will try another bottle each week until it’s ready–be patient! Okay, a bit longer than usual, but I had some fun writing this post. If you enjoy beer and haven’t thought about making it, pop over to Home Brew Talk to learn more. Or visit your local home brew store–usually they’ll sell wine kits too. There is an initial investment, but honestly it’s not hard to do–and what beer aficionado wouldn’t love to quaff his own hand made brew? Traditionally Published Authors a Step Closer to Indies? One of my favourite “traditionally published authors,” Kevin J Anderson, recently posted about what he called a ground breaking change in the publishing industry: a new service called Cunable, which allows authors to sell their published works as eBooks without going through a major distributor. You can read it here. It is indeed a big change, but what does it mean for the Indie Publishing Community? 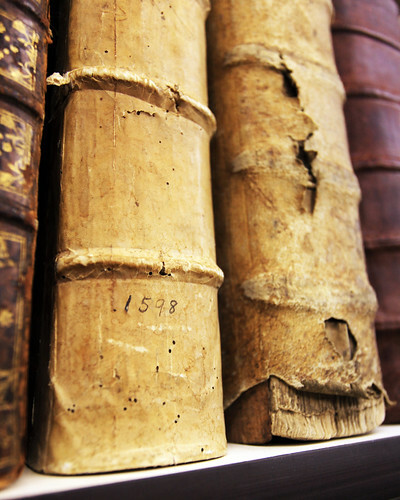 There are those in the community who are much better versed in how Cunable will affect self-publishing, if it will at all–but I wanted to comment on it. I’ve started to see Anderson as a champion for the eBook format; he’s released a lot of his back catalogue as eBooks on his own website, and seems eager to encourage e-reading. It helps that he’s a major voice in the sci-fi and fantasy genres–he gives exposure to the format. And now, he’s embarking on this experiment with Cunable. The creator of this service, John Grace, describes it as “Self Retailing for the Published Author,” and it seems very close to how Indie writers are publishing and selling their books. Of course, Indies see another (and more important) benefit to self-publishing–we get our work out directly to those who want to read it, and can communicate with our network of readers. I think Cunable will fulfil this goal too, though Grace doesn’t explicitly reference it. Grace would like to see the Big Five sign on with his service so he can distribute published works through his website, or allow authors to distribute through theirs. Anderson says that the 30-35% cut that publishers normally get from sales would instead be split between Cunable and the author–I’m not sure how happy publishers would be about that, but it does sound like a good idea for people who just want to write for a living. Really, it’s about taking the publisher out of the picture; getting the book directly from the author, no middleman, no fuss. Another reason Indies do what they do. I’m glad a person like Anderson is involved in this, as he could give Cunable some real momentum. It will be interesting to see where they go. But what does this all mean? The first thing that popped into my mind when I read the blog was that published authors are going to start flooding the market. Anderson has already dipped his toe in, and I could see others following him. And that’s good on one hand, because it gives even more credence to self-publishing and to the eBook format. But on the other hand, I don’t think self-publishing needs more credence–and the system itself could potentially change. The funny thing about Community is that it’s (ironically) exclusionary. A community of like minded people will either exclude those who aren’t of “like mind,” or change its own definition to welcome them. I see the latter happening here; if Cunable takes off and traditionally published authors start joining the ranks of the self-published, the Indie Community changes. It may not be a bad change–maybe the traditionalists will join the ranks of Indies, something that’s already been happening for some time. This could only strengthen the community. But–and this is the thing that I really wonder about–it could also mean greater competition. One of the hardest things about self-publishing is that the marketing is all up to you. It’s challenging, and I think it takes a special type of motivation to get it done right. But put those people up against someone who has an established name, and the competition gets a lot more fierce. I loved Anderson’s Captain Nemo, for example, but I think Lindsey Buroker’s Emperor’s Edge novels are better. An uninitiated reader given the choice between them might go with the name they recognise (though I have to give props to Buroker, arguably one of the most recognisable names in self-publishing). I’m not saying this is a good or a bad thing–but it’s something to watch as it develops. The one big difference I’m seeing, though, is pricing. Anderson’s prices haven’t changed since partnering with Cunable. His current Zombie PI series Dan Shamble is selling for around $13 a book–most Indie books hover between $1 and $5, and given some of the great percentages Indies get, both can potentially earn about the same from each sale. But–and this is a big but–given a choice between a $5 eBook and a $13 eBook, many will choose the lower price. 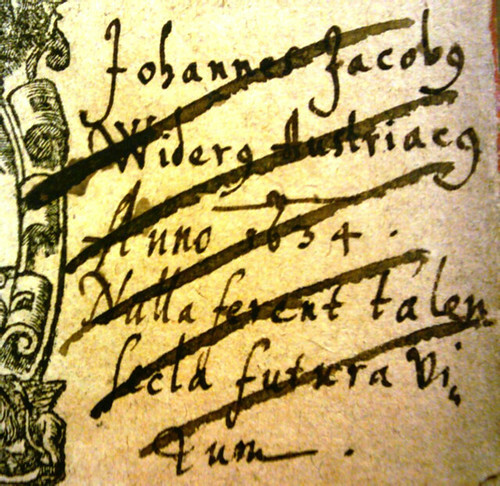 For Cunable, I think this is inescapable–they’re still distributing books that are under a publisher’s contract. But for a company moving into the self-publishing model, it’s an interesting complication. At any rate, as I said above, there are those better versed in the self-publishing model who can comment on this development more eloquently than I…but it’s a very interesting development, and I’m excited to see where it leads. I applaud Anderson for getting on board, and my big hope is that this will encourage the continued paradigm shift for publishing. At the very least, it helps with distribution and accessibility–and in the end, getting more books into the hands of readers is what it’s all about. 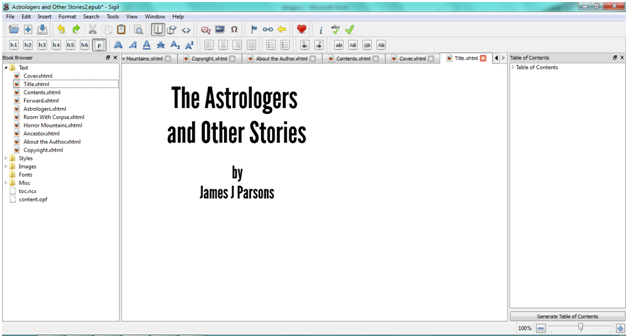 So we’ve talked about the basics of formatting eBooks, and why it’s important to do it well. Today we’ll look at a couple tips for going that extra mile. I should say that I got most of these ideas from others, and you can find the relevant links on my Writers Resources page under formatting. Special thanks to Cameron, Guido and Piotr. The main things you want to look for when you’re formatting is that your line spacing is correct (Word can really mess with this), and that you’ve got a working Table of Contents. We’ll start with the TOC–Sigil makes it really easy for you. The bold text is your Heading and will show in the TOC. The picture above shows a heading–the bolded text. At the beginning of each section, you’ll want to highlight the chapter title (in this case, the story title, as it’s a collection of stories), then click the H1 button on the top left of the program. This gives it the <h1></h1> tags, which tells the final file that it’s a heading. Do that for all your sections. When you’re done, go to Tools and click on TOC Editor; this will allow you to select which Headings will appear in your TOC. Deselect things like the copyright page and other front matter if you like, and there you go. On the right side of the picture above is the complete TOC. When you run the finished ePub file through Calibre, you’ll be able to further codify the TOC, which will then appear in the final book. In professionally published books, you’ll often see the first words or letter of a new chapter highlighted somehow. Sometimes the first few words will be in bold text, sometimes the first letter is an image file of an ornate letter, with the rest of the text wrapped around it. This is something you can accomplish in Sigil. Note the first few words are capitalized. Neat! Here, I’ve highlighted the first few words and used another feature of Sigil: the All Caps button. 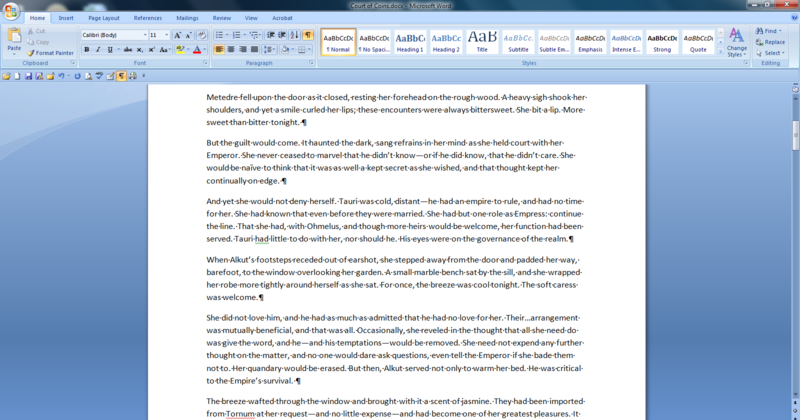 You find this in Word as well, of course, but if you carry it over to Sigil from there, it’ll mess up the formatting. You want to do this in HTML, so don’t do it in Word, let Sigil do it for you. Highlight the text you want, click the button (it’s the one I’ve circled in Red) and there you go. This nicely sets the first few words apart, a simple way to give a nice polish to the book. I’m not sure I like it for my book–my second story, Room With a Corpse, looks a bit silly when I do this–but it’s an option. You could also just bold the text. If you want to add the ornate letter I mentioned (you can see a nice example on the Sigil page), just delete the first letter, then right click in that spot and click “Add Image.” You’ll need to find an image of the letter or make one yourself, but that’s all there is too it. Which brings us to the next example. Because you’re effectively editing in HTML, you can’t use different fonts without going into the “back end” and editing font tags. Even if you do that, there’s no guarantee that your fonts will display on all readers, so it’s not advised. But there is a way around it. Open up an image editor–I use Paint.net–and make a small canvas that’s 500 by 375 pixels. This is a good size for most e-readers. 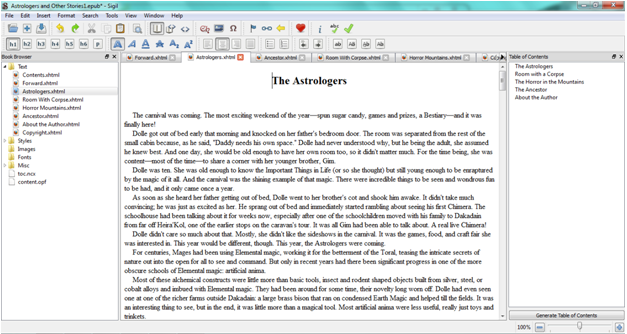 Then click on the Text tool and type the title of your book in whatever font you like. Here’s the Title Block for my book–nice font! You can use some of the main fonts you’ll find installed on your computer–but they’re pretty boring, and people will recognize them. (Remember when Stephen Spielberg used the Papyrus font in Avatar?) Look for other fonts online–they’re easy to install and use–but be careful, because many of them are licensed, and you’ll need to buy them. Don’t go stealing fonts! Instead, go to Font Squirrel, where you can download fonts for free. In the picture above, I’ve used League Gothic, a popular font that “pops” nicely. So make your image (make the background transparent) and save it as a jpg file. Then create a new section wherever you want your title block to appear. Instead of adding text, just right click and Add Image, throw in your new title block, and ta-da! A nice attractive font to act as your title page without screwing up the user-end e-reader. Finally, you’ll want to do the same thing with your cover by adding a new section at the very beginning and adding the cover as an image. This will display it on readers not only as a thumbnail when the user is looking through their library, but when they first open the book. I don’t have an example, but check out the link by Cameron above for a nice one. So there you have it. A few quick tricks that will give your finished book just that much more polish. It’s true what they say: the devil’s in the details. It may seem like a lot of work to add things people probably won’t notice much, but as I said in my last post, people will notice if they’re not there. And now a quick plug. You might have guessed that because I’m in the final stages, I’m ready to release my book soon–and you’d be right! 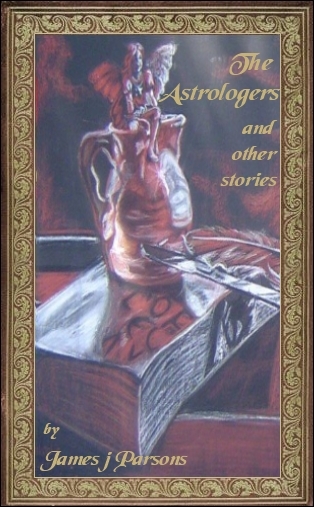 Watch for The Astrologers and Other Stories to be available on Amazon and Kobo stores by October 23. And, if you’d like a free copy, why not join my mailing list? Anyone who signs up before October 23 will receive a copy as soon as it’s ready for distribution. I’ve already made a short post today–see below for my re-blog of David Hewson’s nice post about Scrivener and Screenshots–but I wanted to add a little something of my own too. As I’ve embarked on this self-publishing journey, my biggest impression has been of just how much there is to think about–and how much help is available to writers in the same position. Publishing an eBook isn’t as simple as writing something, converting it, and sending it to a store. There’s a ton of work involved, from many aspect that aren’t even really connected with writing (like marketing, social networking, graphic design, and HTML coding/formatting of the product). The amount of work that goes into it is impressive–and intimidating. Fortunately, the indie writer’s community online is terrific. People like Yesenia Vargas, Ryan Casey, and Joanna Penn are great resources, centering on different aspects of the game, and there are hundreds more. Take a look at the page–I hope you find it helpful!